Is there anything more demoralizing than being cut off from Purpose? A good way of driving a person mad is forcing them to do purposeless activity over and over. 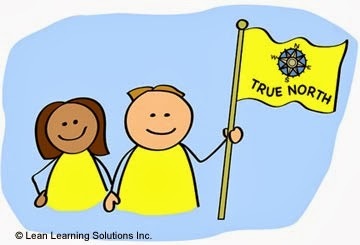 Strategy Deployment begins with True North, our strategic & philosophical Purpose. We also encourage leadership teams to draw a picture of where they want to be. Our image will show our hard & broad-brush goals, and how we will go about our business. But the business chessboard is foggy, multi-dimensional, and unpredictable. Why bother to define a distant, uncertain future? Because doing so forces us out of the rut of our current thinking. We engage dormant neural pathways thereby, and begin to see the "clear blue sky", i.e. what's possible. Rapid experimentation in accord with the Plan-Do-Check-Adjust cycle dispels the fog. We get a little better every day. Strategy Deployment is messy, intuitive, imprecise, a marriage between the Right & Left brain, between intuition & logic, art & science. I'm reminded of Jack Nicklaus, perhaps the greatest golfer ever, whose swing routine always entailed imagining the perfect shot. Or of Michelangelo seeing the perfect sculpture in the marble block.